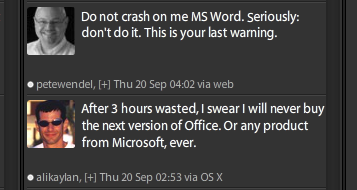 I saw these two juxtaposed tweets in my Twitter stream today. These kinds of issues are par for the course with new software, but in an old timer like Office it’s very hard to excuse. This entry was posted in shame on September 20, 2012 by dtravisphd.